John is the Head of School at Phillips Academy, Andover. He serves as Chair of the Board of Trustees of the Knight Foundation. He also serves as a Board member of the Berkman Klein Center for Internet & Society at Harvard University, the Boston Athenaeum, and MIT Press. John’s research and teaching focus on new media and learning. He has written extensively on Internet law, intellectual property, and the potential of new technologies to strengthen democracies locally and around the world. 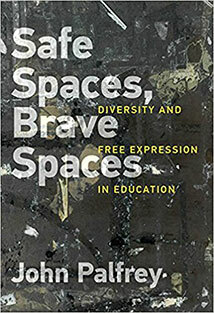 He is the author or co-author of several books, including Safe Spaces, Brave Spaces: Diversity and Free Expression in Education (MIT Press, 2017); Born Digital: How Children Grow Up in a Digital Age (Basic Books, revised edition, 2016) (with Urs Gasser); BiblioTech: Why Libraries Matter More Than Ever in the Age of Google (Basic Books, 2015); Interop: The Promise and Perils of Highly Interconnected Systems (Basic Books, 2012) (with Urs Gasser); Intellectual Property Strategy (MIT Press, 2012); and Access Denied: The Practice and Politics of Global Internet Filtering (MIT Press, 2008), Access Controlled: The Shaping of Power, Rights, and Rule in Cyberspace (MIT Press, 2010) and Access Contested: Security, Identity, and Resistance in Asian Cyberspace (MIT Press, 2012) (all co-edited). John served previously as the Henry N. Ess III Professor of Law and Vice Dean for Library and Information Resources at Harvard Law School. At the Berkman Klein Center for Internet & Society, he served as executive director from 2002-2008 and has continued on as a faculty director since then. John came back to the Harvard Law School from the law firm Ropes & Gray, where he worked on intellectual property, Internet law, and private equity transactions. He also served as a Special Assistant at the U.S. Environmental Protection Agency during the Clinton administration. He previously served as the founding President of the Board of Directors of the Digital Public Library of America. He also served as a venture executive at Highland Capital Partners. He previously served on the Board of Directors of the Mass2020 Foundation, the Ames Foundation, Data + Society Research Institute, School Year Abroad, Open Knowledge Commons, and LRNG, among others. John was a Visiting Professor of Information Law and Policy at the University of St. Gallen in Switzerland for the 2007-2008 academic year. John graduated from Harvard College, the University of Cambridge, and Harvard Law School. He was a Rotary Foundation Ambassadorial Scholar to the University of Cambridge. He received the U.S. EPA Gold Medal (highest national award).